I was leafing through the weekend paper and saw a recipe for raw chocolate balls. 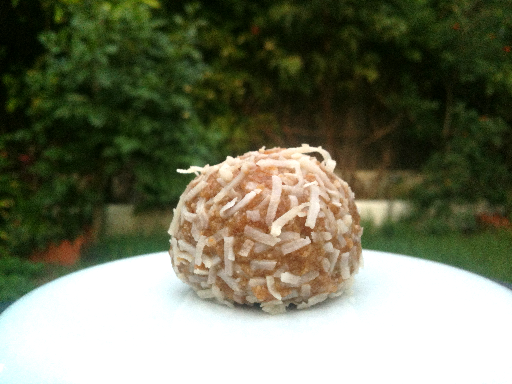 I didn't like the recipe so changed some of the ingredients and came up with this super delicious Peanut Butter Truffle Ball recipe. Remember the coconut balls recipe with crushed teddy bear biscuits and condensed milk? Well these taste exactly like that but with a peanut butter flavour. So yum, yum, yum! Place almonds into a food processor and blend until they become a nut butter. Add all other ingredients and blend until well combined. Roll tablespoons of mixture into balls then roll in coconut. Place on a tray and into the fridge for 1 hour to set. Store in an airtight container in the fridge for up to two weeks but they won't last that long.